← Roads, Roos and Landscapes. After a very restful night at Marshall River Free camp we woke to another perfect day and headed for Gem Tree in the Hart’s Range. Thursday, not just any ordinary day. The road was long. We were now on the Plenty Highway and we had heard stories that it wasn’t the best road but quicker to where we wanted to go. The road was a bit of a challenge but after our worst road ever in my books to Murray’s Idea of Adventure it was okay, we just took our time. We met a bit more traffic today more so than other days. The best was a huge road train in the red dust, we could see him coming for miles and we were peppered with dust when he went by. We saw wild passionfruit growing on the sides of the road and stopped to pick some. Hope they’re a nice flavour. Arriving at Gem Tree Caravan Park we had found a little oasis in the middle of nowhere and I immediately loved this rustic little gem. We booked in and they placed us on Zircon campsite, unpowered, as we do have solar. This was our little ranch on the hill and we were very happy with it. Back out we went to find firewood for our fire pit which wasn’t too difficult. We met a lovely young couple who joined us for our fire that evening with their German Shepard, Charlie. They filled us in on all we needed to see in and around the Alice. Part of this adventure was to go fossicking so we booked a tag along tour for the next morning at 8.30am and prayed the rain held off. What we found out was that when the Morris’ hit the Northern Territory to camp a weather event had been predicted for extreme weather with quite a bit of rain to come. Great, I wasn’t excited about this. Take it as it comes and we did. Thursday night campfire with Tim sand Katie. Camp Zircon, must have been a lucky sign. After a great night’s rest we set out Friday morning on our gem adventure with our tour guide Chris. They show you where to go and what to do then your on your own. 40litres of water, a shovel, a pick and some sieves on board and we were off. We arrived at Mud Tank fossicking area 15kms later and began to search for our Zircons. 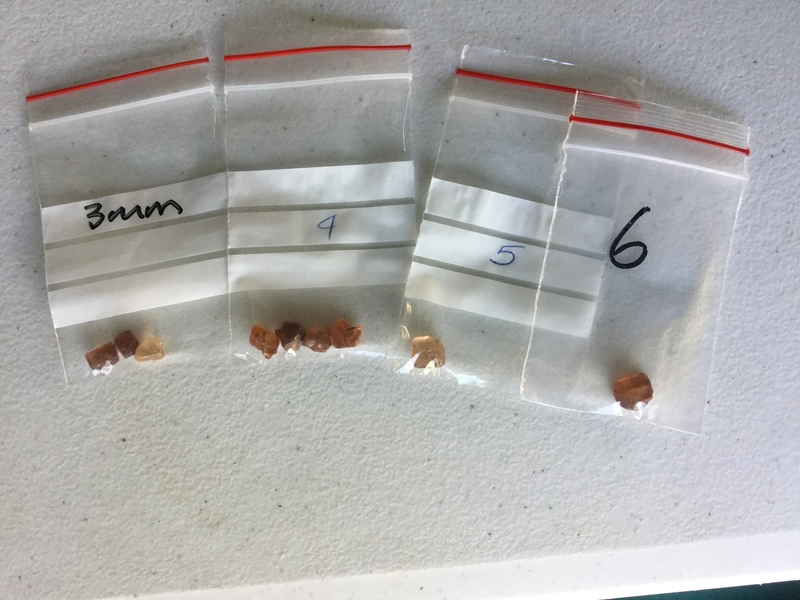 In every seive we found at least one zircon and we were excited. It did rain a little out there and it got a little cool at one stage but we had a ball. 2pm came too quickly and our day was over, we headed back with our stash of gems, a hot refreshing shower awaited us and happy hour. How excited we were with our little tin of goodies but we had to wait till Saturday to get Aaron to check them out for us. Saturday we got our washing done and returned to the office for a phone card to let the boys know we were okay and to have our gems inspected by Aaron. It was so good to talk with the boys even they were happy to hear our voices. Andrew checked out a recipe with me. The money ran out just as Simon wished me Happy Mother’s Day and I hadn’t even realised it was this week. Miss my boys. 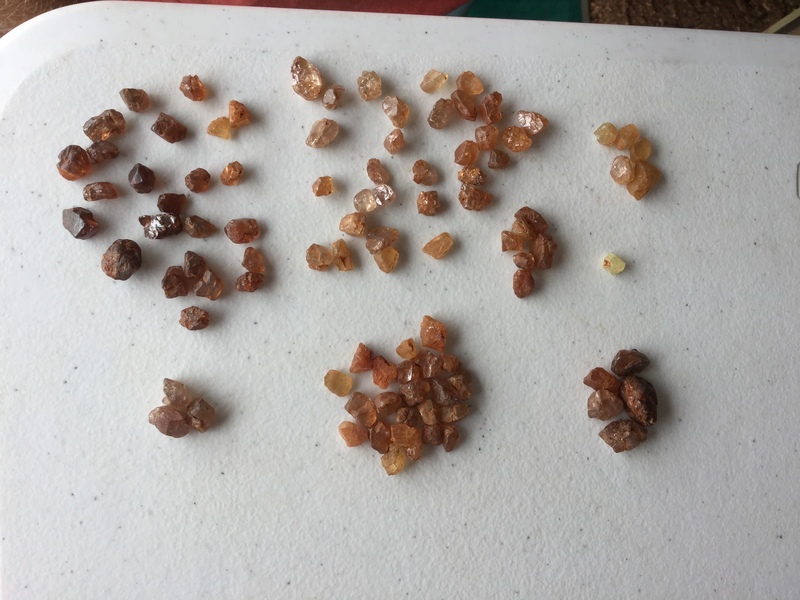 Our Zircons had a few cutters among them so we were very happy with that. We celebrated with a cup of tea and a piece of our fruitcake, as we had no alcohol left. 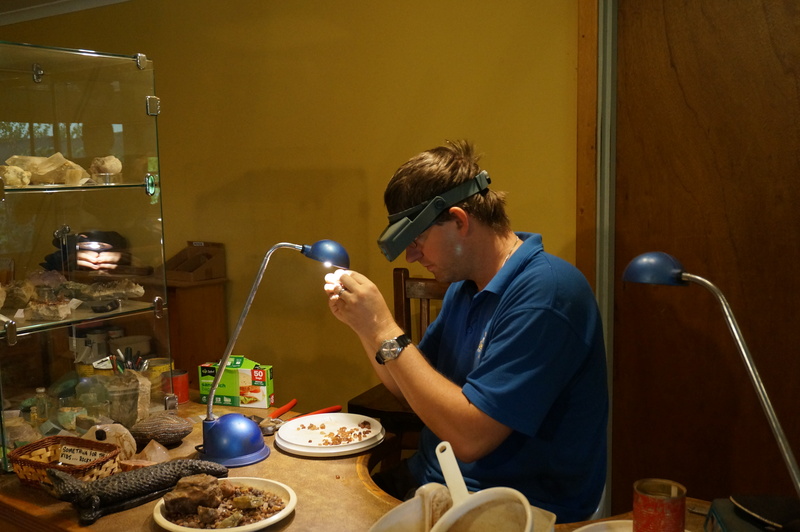 Aaron sorting the cutters from the rubbish. Disappointing though was the fact that our dinner for that night was cancelled due to the weather as it was a camp oven cookout, baked dinner, under the stars with all the trimmings and drinks plus a movie on the gem field history. We took a wander around the camp oven cookout area and hope to return for a dinner one day in the future. We checked everything was secure before retiring that night as the weather was expected to change in the early hours of Sunday morning. 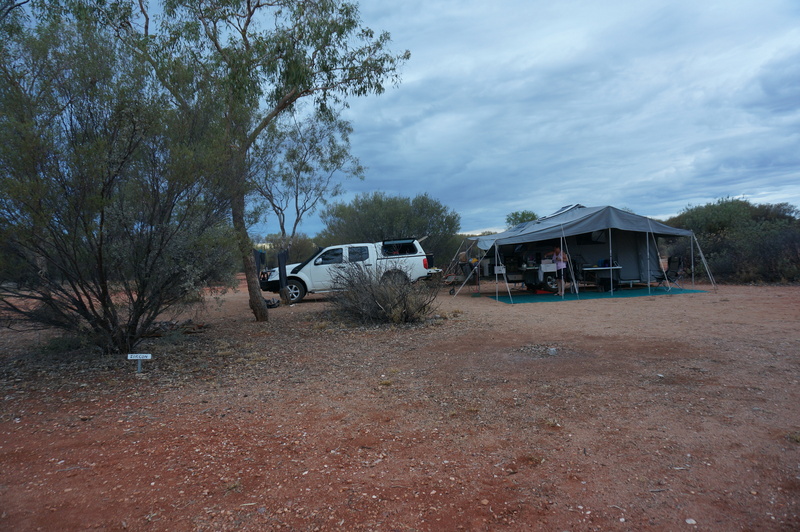 It rained all night, the tent was moving around on the camper and Murray checked it about oneish but the worst part of the storm was to come around 4.30am when one of the pegs came out of the ground and a pole came crashing down. Murray was out again hammering pegs into now soft ground compared to when we set up and every peg, which aren’t little ones, bent. I tried to hold up the umbrella but it wasn’t much help. He came back in with drenched pyjamas and had to strip off. It was now that I really needed to go to the toilet but I wasn’t about to walk too far at this stage so it was in the bush I went just near the tent. Yes, you heard correctly everyone, even though it was dark and wet I became daring. 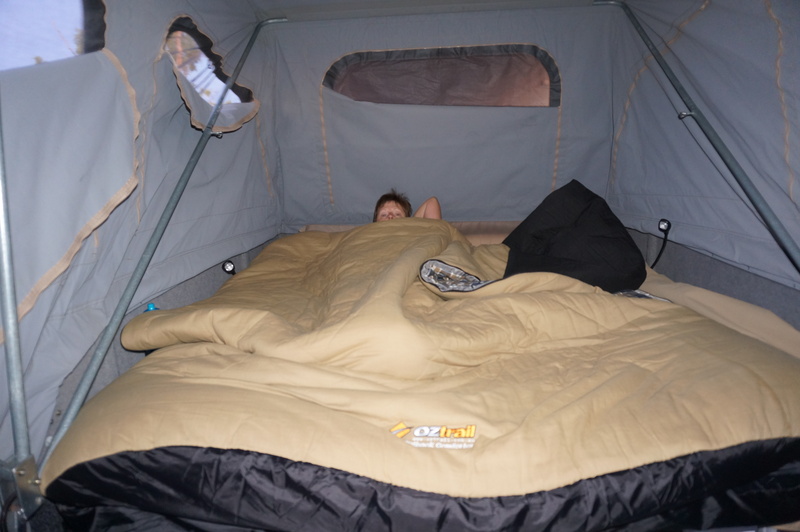 We woke to more and more rain Sunday morning and decided to stay put for another day. 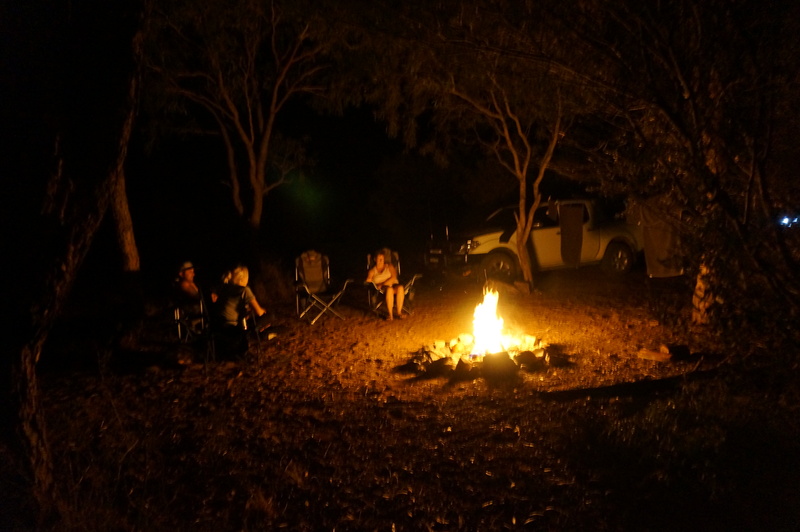 As it was Mother’s Day it was a chance to kick back, relax, think about our next moves and write a few blogs ready for when we get internet, hopefully in Alice Springs. We paid for our night and ordered some alcohol for happy hour with our nibbles to celebrate Mother’s Day. I love the local delivery service around here. Luckily we stayed where we were as around two in the afternoon up came the wind again and our annexe became a kite. I was hanging onto it for dear life while Murray was running round trying to get more pegs into the ground. In the end we decided to take it down, secure the trailer, close all the windows and sit inside and wait for this cell to pass. Which it did about half an hour later. We emerged to no damage to our trailer and the clouds were starting to dissipate a little. After a refreshing hot shower we sat down and enjoyed our drinks and nibbles. Happy Mother’s Day to all my friends and family and to my wonderful mother whom I miss every day, this is the first of many without you Mum. You were missed. Also happy Mother’s Day to Gladys, Murray’s lovely mum. Tonight we are once again under a starry and fresh sky our first since we got here four nights ago. It is unbelievable how quickly the weather can change out here. Tomorrow, Monday 9th April we move onto Alice Springs for a few days. More excitement to come. This entry was posted in Adventure, Challenges., everything, Life, Love and Laughter., New People, Travel. Bookmark the permalink. 1 Response to A Gem of a Place. Looks like you had some luck with your gem stones. Glad you could contact the boy for Mothers Day. Hopefully you do not have too many storms during the nights.